There are a lot of positives to my Ironman training schedule, but one of the drawbacks is that it allows for only two races. I already did the Oly and the half iron isn’t on the schedule until September. 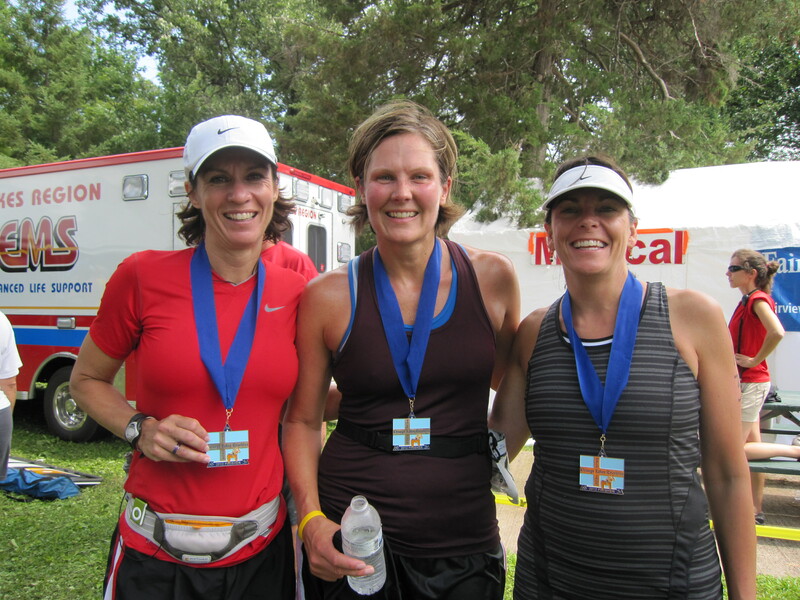 The Chisago Half Iron was my “A” race last year and it was a lot of fun. The course is nice and there are lots of friends that do it so it’s fun to see everyone out there doing there thing. Even though I couldn’t race the whole thing this year, I did have a long bike ride followed by a short run on the schedule. Luckily, I have two friends who also think doing a half iron relay is the perfect way to spend a Sunday. 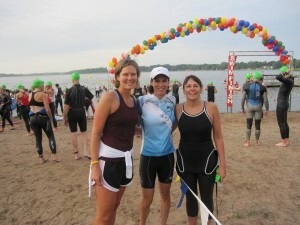 Here is our team before the swim start. Beth M was our swimmer and she is such a good one that she didn’t look nervous at all. She actually looked excited to to get in the water. Holly is a fantastic runner with many races under her belt. She didn’t seem worried at all about waiting around for four hours and running in the heat. Because we were a relay, Beth started in the second wave. She swam so well that I ended up starting the bike in front of a whole lot of people who would pass me over the course of the next three hours and change, but that’s okay. The goal of today’s ride was to do what I needed to do for my training and try to have a good time. What did I need to do for my training? The first thing I wanted to work on was race nutrition. I’ve been using EFS sports drink for hydration and the EFS Liquid Shot for additional fuel, but I haven’t used them in a longer race situation. On training rides, we usually stop a couple of times to fuel up, so this would be my first time taking in all my calories while still on the move. In addition to the EFS products, I also had some Power Bar Protein Plus bites with me in case I wanted to eat something solid. Last year for this race, I never tried to calculate exactly how many calories I needed per hour. My approach then was to just try to fuel consistently throughout the ride. This time, I had a goal for the number of calories I wanted to take in each hour. I took the total number of calories I would burn in an hour times the percent of calories I know I’m getting from carbs in Zone 2, and aimed for 75% of that. I had read a couple of weeks ago that Chrissie Wellington aims to get 1 gram of carb for each kg of her body weight per hour. This number for me is not that much more than my 75% of calories burned goal, so I figured that I was on the right track for a conservative number of calories to consume. All three calorie sources worked great for me today. I was able to fuel up without losing too much time and my stomach seemed happy with the combination. On my 30 minute run after the ride I felt fueled and hydrated. I’m sure over the next 15 weeks of training I will need to make some adjustments, but right now I’m feeling good about where I am with my nutrition plan. My other goal for the race was to stay in zones 1 and 2. Last week I had my metabolic test for the bike redone to tell me zones, number of calories used per minute in each zone and percent of fat vs. carbs burned. Increasing my fat burn is something I’ve been working on since last fall, and the past several months I’ve gotten serious about it by also changing my diet. My heart rate in zone 2 was high enough in the test that I thought I could ride the whole 56 miles in zone 2. By staying in zones 1 and 2 for the Ironman, I can reduce the amount of calories I have to process during the race, reduce the chance that I’m going to bonk and hopefully give my chance to run the marathon. Most people equate exercising in zones 1 and 2 with going easy. That’s not necessarily true. The zones are an indication of the type of fuel the body is using. Zone 1 is greater than 50% fat burn and zone 2 is more than 30%. By training and eating a certain way, you can train your body to work very hard and still burn a higher percent of fat. When I tell people I want to bike in zone 2, I get the feeling they think I’m just playing around and not trying to go fast. That’s not true. My Ironman day is going to be a long one, but I’m not playing around. Today was a test to see if I could stay in zone 2 for 56 miles and maintain a speed that would make sense for the Ironman. After months of heart rate training, I’m happy with where I am on this. For 12% of the race I was in zone 1, 80% in zone 2 and 8% in zone 3. While the course had a lot of flat miles, there were some climbs that caused me to briefly pop over into zone 3. The big question was what kind of speed does this translate into for me? I biked 18.1 mph and finished the 56 miles in 3:04:58. Yeah! This is almost two minutes faster than what I biked last year, so not much difference there. 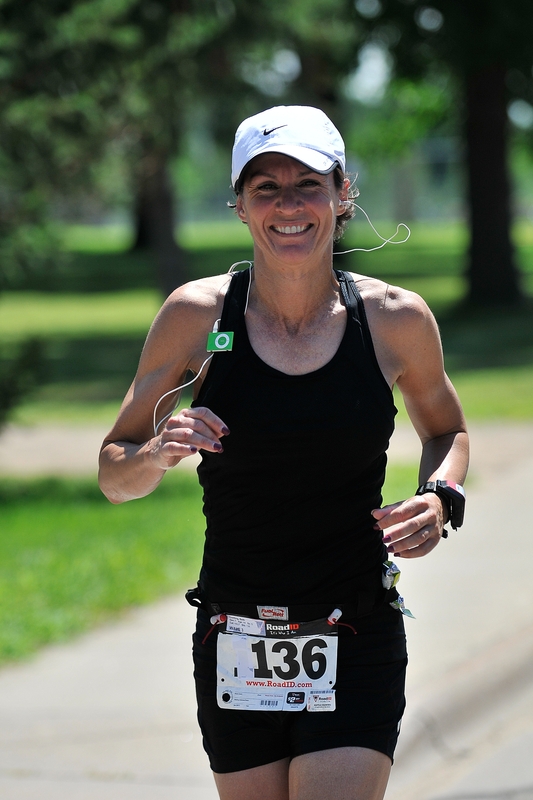 Even though last year I had to run after the bike, I had tapered to prepare for the event since it was my main race. This year, I didn’t stop my training at all to get ready. I ran 9 miles yesterday along with riding 45 minutes. I also felt better getting off the bike this year and more prepared to run. My training plan had a 30 minute run after the bike, so after Holly took off for the run leg of the race I changed shorts, put on my running shoes and got my run done. My legs felt fresh and I felt pretty good even though it was hot. Our team time was 5:54:49 and our team was 19th out of 85 teams. Not too bad! The best thing was that we all had a fun day and all three of us had a race we could be proud of. I’ve done a relay twice now and just love it. It’s like a catered training day with all of your friends and a built in cheering section. This race had the added bonus of a medal at the end, something that none of my races this summer have had. I needed a medal to show for all of my training so far! Now that the racing fun is over, it’s time to settle in for a solid six weeks of training before tapering for a few days to get ready for Square Lake, my chance to do the full half iron as training for IMFL. I’m going to miss doing the relay, but excited about testing myself, too. That race, unfortunately, does not have a medal which is contrary to my theory that any race that takes over 2 hours to complete should have a medal at the finish! Not only does it sound like you all had and absolute blast, but your team did an awesome job! Way to go, Beth and team! Your training is obviously going very well. Keep it up, and much continued success to you! Now that’s what I call giving 110%! Thanks for catching my typo, Brian! Should be 12% in zone 2, although I like the idea of trying 110% better! Congratulations! That sounds like so much fun. I LOVE relays! And yay on your medal.